My hair had been very long lately. It hadn't been that long for more than a decade. I liked it, maybe for the reason that it always brought me compliments. Since I learned about having to have chemotherapy, and because of the high probability that I would lose my hair, I decided to cut it very short before the treatment. 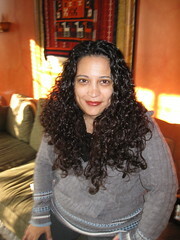 I did cut it on Tuesday, November 11, and donated it to Locks of Love. 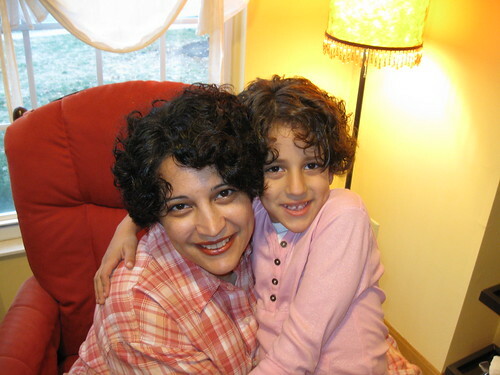 Tala insisted that she have her hair cut the same day with me. Sweet supportive Tala! We picked the same hair cut. 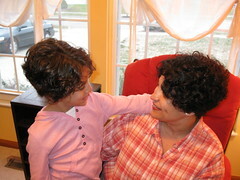 Tala told the hairdresser, "Mom and I are going to be twins with this haircut." I was scheduled to start chemotherapy today, but because there are many tests involved to be done before and Thanksgiving coming up, it was postponed till December 1. I was kind of disappointed. I wanted to start and be done with it, reveal the unknown of how I will react. But maybe it's for the best--to allow me more time to get over Jana and Anas leaving and build more strength. The surgical oncologist is confident that he got all the tumor out with the stomach. But the treatment is needed to increase chances of survival and kill any cancer cells that might have been left behind or have traveled in my body. The doctors say that some people fly through therapy as if it's nothing and some would have a horrendous time. I'm hoping to be somewhere in the middle. Moody and Tala can't comprehend why I have to take medicine that would make me weak. They keep asking why would the doctor do that to me. We told them what to expect in the coming months and still need to do more talking to help them cope and adjust. Great team-member you have beside you. :-) Best wishes on the upcoming days as well as through the recovery process. Thanks ibeebarbie for your support. I'm always curious about your name! Ahlan Um Dania, Thanks for your kind and encouraging words, I'm glad you like the blog and we're glad you are visiting it. Your compassion is much needed and appreciated--thank you! Hope you, Dania, and Abu Dania are doing well and keeping warm for the early winter, We are freezing already here. Mom and Tala just hit a slide in the middle of the road walking to the bus stop. It's ICY! I wish you well & be strong. Enjoy the Thanksgiving with family. I haven't read your blog in a while , sorry but I wish you well and will say prayers for your quick recovery .I love the new look , lol !I loved the pictures of the kids playing in the leaves . I have many happy memories of playing in the leaf pile too .How wonderful your parents were able to come and visit you there in the US . Allah bless and keep you safe . I wish you well, and may Allah give you all the strength that you need in these difficult times and may bless your family. labas 3alek inshaAllah :) I hope you get well soon!! Happy Belated Eid! I wish you a very healthy outcome after your chemo...by the way, your hair looks very nice short...it makes you look young and fresh. i love your recipes that you listed for thanksgiving...thank you for sharing.